Here is a list of some helpful travel tips and frequently asked questions about your visit to Niagara Falls. Niagara Falls Border crossing information, passport information and identification requirements for Niagara Falls border crossing. U.S. Citizens returning to the U.S. after visiting Niagara Falls Canada are required to provide a US passport, passport card or an enhanced drivers license at the inspection checkpoint. Enhanced licenses are available only for residents of NY,MI,VT & WA. Therefore…if you are a U.S. citizen living in the U.S. and cross the border to Canada and attempt to re-enter the U.S. you will need one of the above listed forms of identification. NO EXCEPTIONS! Children that are U.S. citizens under the age of 16 travelling from the U.S. to Canada and returning to the U.S. by land or sea (car or boat) are not required to have passports. An original or certified copy of their birth certificate is required. If the children are not yours you must provide a signed hand written note by the parent indicating how long the child will be in the country along with telephone numbers for the parents. You will be denied entry if you are lacking proper documentation. A printed copy of the parents license/passport can help too. Visit the U.S. State department website for more information. If you have ever been charged with a DUI (driving under the influence) in the U.S. or convicted of a minor offense you may be denied entry to Canada regardless of how long it has been. There has been a significant number of travelers denied entry even for minor infractions. Click here for more information. For official US border crossing information visit this link. The previous link changes often and you may need to start your search here: www.cbp.gov. If you are an international traveler and need information on entering the US please visit this link. For official Canadian border crossing info visit canada border services. VISA INFORMATION – If you are an international traveler and not sure if you need a tourist visa click here. If you know that you are required to apply for a visa to visit Canada you can do it here. Persons wishing to travel to Canada who are not U.S. citizens (ie: foreigner) may be required to get a tourist visa from the Canadian consulate in the country from which they are arriving from. 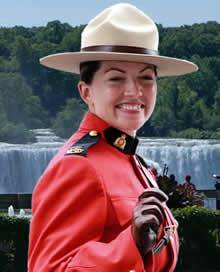 If you are in the USA on a visa and wish to visit Canada while in New York there is no Canadian consulate located in Niagara Falls. YOU CANNOT OBTAIN A TOURIST VISA AT ANY OF THE BORDER CROSSINGS. When contacting the Consul, inform them that you wish to obtain a “temporary resident visa”. As of February 2019 the fee per person is $100.00 for a single entry visa, $150 for a multiple entry visa or $500 for a family (multiple or single entry). For online information visit the Canadian Consul Website. DECLARING PURCHASES – If you make purchases and travel between Niagara Falls Ontario and Niagara Falls New York be sure to save your receipts. When crossing the international border you will be required to declare all purchases. Certain items may be taxable or you may qualify for tax refunds. Please visit the duty free stores located at the bridges between the U.S. and Canada for more information. INTERNATIONAL BRIDGES – Although border security has increased significantly, crossing of either the Rainbow bridge or the Queenston/Lewiston Bridge are back to usual transit times. Expect one hour delays on holidays including Canada Day, Fourth of July and Labor day weekend. There are three International bridges between the U.S. and Canada within 6 mi /9.6 km of the Falls. 500 yards/ 457 m from the American Falls is the “Rainbow Bridge” which offers a spectacular view of the Falls. There is no commercial traffic allowed. You can walk, bike or drive across. 1.8 mi/ 2.9 km north of the Falls is the “Whirlpool Bridge”. Only NEXUS cardholders can use the Whirlpool bridge. 5.6 mi/9 km north of the Falls is the “Lewiston-Queenston Bridge”. This bridge is for all types of vehicles. Bicycles are allowed but not recommended. Bridge status traveling into the U.S. When crossing the international border be sure to bring a valid passport. You may be denied entry if you are lacking proper documentation. PETS – For travelers visiting Niagara Falls with their pets. Dogs are welcome in the park areas as long as they are leashed and cleaned up after. If you plan on crossing the border with a pet you may be asked to provide a current vaccination certificate. Most hotels do not allow pets. If you are interested in bringing your pet into Canada please visit the official Canada Inspection page. If you are interested in bringing your pet into the United States please visit the United States Department of Agriculture’s website. Only official guide dogs are permitted on certain attractions (therapy pets are not included). 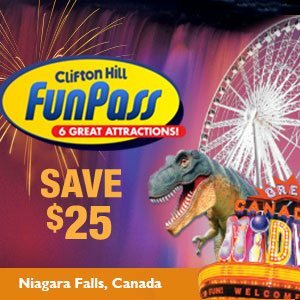 LOCAL ATTRACTIONS – During the busier months of July and August, three popular attractions Boat Rides below the Falls, Cave of the Winds and Journey behind the Falls can have long waiting lines. The best time to visit is in the early morning or late afternoon. If you are visiting during the winter months all attractions are open with the exception of the Boat Rides below the Falls, Whirlpool Jetboat, Cave of the Winds and Niagara Zipline. CURRENCY – If you visit Niagara Falls from a foreign country (ie: you are from the U.S. traveling to Canada) try to purchase everything using your debit, credit, or charge cards. You will usually receive the best exchange rate from your bank. If you need to exchange currency in Niagara Falls Ontario try Casino Niagara and the Fallsview Casino. They usually give the best exchange rate (but don’t lose it all there!). There are also currency exchanges at the bridges & banks. Most businesses will exchange cash for you but do not expect a good rate. CRIME? – Niagara Falls has a very low crime rate. However do not leave valuables unattended in your hotel room or vehicle. If necessary check valuables with your hotels security. If you have a vehicle leave nothing in plain view. CROSSING BORDER WITH MEDICATIONS? – If you plan on bringing prescription medications across the border be sure to bring it in the original prescription container and confirm that it has not expired. Only bring with you what you need for your visit. Large amounts of certain prescriptions may delay your clearing of customs. FIREARMS? – Canada has very strict firearm regulations especially for handguns. All firearms must be declared when crossing the border. Any attempt to cross the border in to Canada without declaring a firearm will result in stiff penalties and possible incarceration. If you are interested in bringing a firearm in to Canada you can find more information here. Q: What time of the year is Niagara Falls open ? A: Niagara Falls is open 24 hours a day 365 days a year. Q: Are the Falls turned off at night ? Q: Is there a charge to view the Falls? A: The parks are free and open to the public 365 days a year. During the busier months of May through September there is a charge for parking your automobile, r/v etc. There are also fees for municipally operated “attractions” ie: cave of the winds, maid of the mist, journey behind the falls. Q: What is the best time to visit Niagara falls and what will the weather be like? 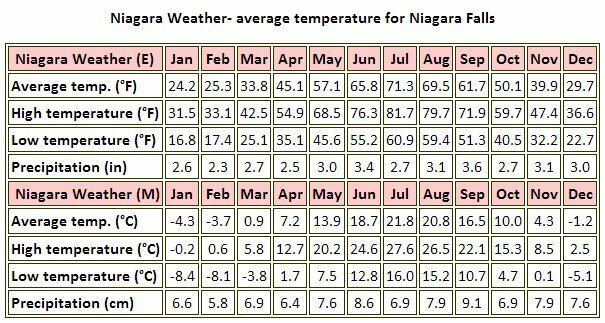 A: The best weather in Niagara typically occurs from mid May until mid September. Our peak season is during the months of July and August. The first few weeks of September are very nice if you want to avoid the crowds and enjoy the warm temps. The first two weeks of October are usually the best time for viewing our Fall foliage. Due to the “micro climate” within the Niagara Gorge leaves tend to peak during the third or fourth week of October. Niagara Falls can be very spectacular even during the Winter. Nowadays more and more people visit the Cataract City year round. For monthly average temperatures view the graph below. Bring appropriate clothing. Summer’s for shorts and t-shirts. During Spring and Fall the weather can go from sunny and warm to cold and wet in a very short time. A light parka is handy and be sure to bring your walking shoes! Q: Where should I stay during my visit to Niagara Falls? A: We recommend you try and stay as close to the Falls as possible. Parking is limited during peak season and getting around on foot & using the shuttle service is the best way to get around and see the sites. We have a list of suggestions and tips here: Niagara Falls Hotel Tips. 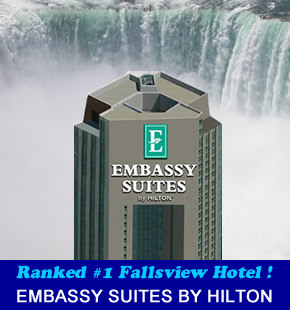 Q: Which Fallsview hotel has the best view of the Falls? A: Please visit our “Fallsview Hotel” page for more information. Q: I don’t have a passport or visa to visit Niagara Falls Canada should I still visit Niagara Falls NY? A: Even though over 90 percent of the visitors go to Niagara Falls Canada you can still enjoy yourself on the New York side of the border. There is a saying that in Canada you can see the Falls but in New York you can feel the Falls, referring to the “Cave of the Winds”. Both sides have their pluses and minuses. Niagara Falls NY is an aging city with not a lot to do after the sun goes down. Niagara Falls Canada has a lot more to offer if staying for a more than a day or two. Q: How can I receive information about Niagara Falls by mail ? A: We do not provide any literature by postal mail. You can use this link to obtain a Niagara Falls travel guide in the mail. Q: What time do the lights turn on at Niagara Falls? A: You can view the schedule right here! Q: When are the fireworks displayed at Niagara Falls? A: The Fireworks are now displayed every evening during the summer months. You can view the schedule by following this link. Q: Which hotel has the best view for watching the fireworks? A: Well we’ve got you covered right here! Q: Are there boat rides available year round ? 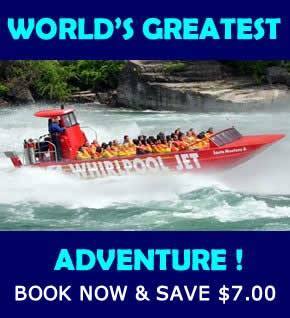 A: Hornblower Niagara / Maid of the Mist and the Whirlpool Jet boat operate from early May until late October. *during the months of November-April, Hornblower Niagara / Maid of the Mist, Cave of the Winds and Whirlpool Jetboat are closed. All other attractions and businesses are open year round. 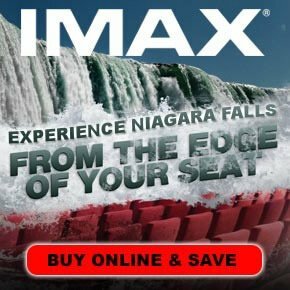 Q: What is the best way to get to Niagara Falls ? A: By air, you have to fly into either Toronto, Ontario or Buffalo, New York. Toronto’s airport “Pearson International” is 78 mi/125 km from the Rainbow Bridge. (1 hour & 11 minutes). Traffic congestion on the Q.E.W. (Queen Elizabeth Way) can double the time it takes to arrive. Realistically it usually takes 90 minutes or more. Buffalo’s Airport “Buffalo/Niagara International” is 25 mi/41 km from the Rainbow Bridge (35 minute drive). Rarely are there traffic delays. To get to the Falls from the airport, you can either rent a car, take a shuttle bus, or arrive by taxi. More information is available from our “transportation link“. 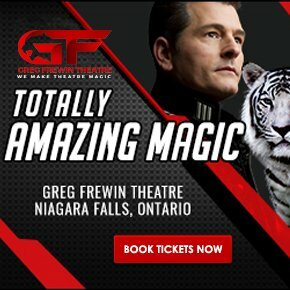 Trailways Bus Service and Amtrak (US) /VIA (Canada) train service is available directly to the cities of Niagara Falls. Hotels do not provide courtesy shuttles to or from the airports. Q: How long will it take to cross the bridge and clear customs? A: Provided it is not a major holiday, you can normally get through inspections in less than ten minutes. Expect a ten to twenty minute wait on Fridays and Saturdays during the late afternoon and early evening going to Canada. Sunday mornings there are delays going in to the US and in the evening going back to Canada. Expect delays of thirty minutes or more on Memorial Day, Canada Day, Independence Day and Labor Day. Q: What is the best way to visit the Falls and see the attractions? A: The best thing to do is map out your itinerary before you arrive. To walk from one side of the Horseshoe Falls to the other via the Rainbow Bridge is 4 km/2.5 miles (8km/5 miles roundtrip) and that is a long walk! First you need to figure out how you will get to the general area of the falls itself. If you are staying at a local hotel find out the proximity to the Falls and plan your activities from there. A typical tourist will visit the maid of the mist boat ride, view the Falls from either Queen Victoria Park in Canada or the Niagara Reservation Park in the USA (or both). In Canada you can easily walk from Table Rock visit Journey Behind the Falls and then walk to the Maid of the Mist docks. On the US side you can walk from the Falls Experience visitors center to Prospect Point and catch the Maid of the Mist and then walk to Goat Island for the Cave of the Winds, Terrapin Point and the Three Sisters Island. Both the Niagara Falls U.S.A and Niagara Falls Canada Parks departments offer a transit system which stops at the major attractions in their respective countries. The Niagara Falls Canada “WeGo” transits along the Niagara River from Table Rock to Queenston Heights Park with thirteen different stops. To preview it’s route visit this link: niagaraparks. In the US the Parks Trolley system runs a three mile circular route and has six stops. 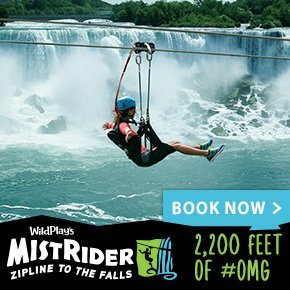 For rates and info visit this link: niagarafallsstatepark. Tour companies are abound in Niagara Falls. Be sure to compare what is included with the tour including admissions to the attractions you will visit. While tours tend to be more expensive, they can take a lot of hassle out of walking everywhere and at the end of the day you are still left with plenty of energy for the evening. Q: How far is the train station from the Falls itself ? A: In Niagara Falls Ontario, the Via Rail station (4223 Bridge Street, tel:1-800-361-1235) is 1.6 mi/2.5 km from the Rainbow Bridge. 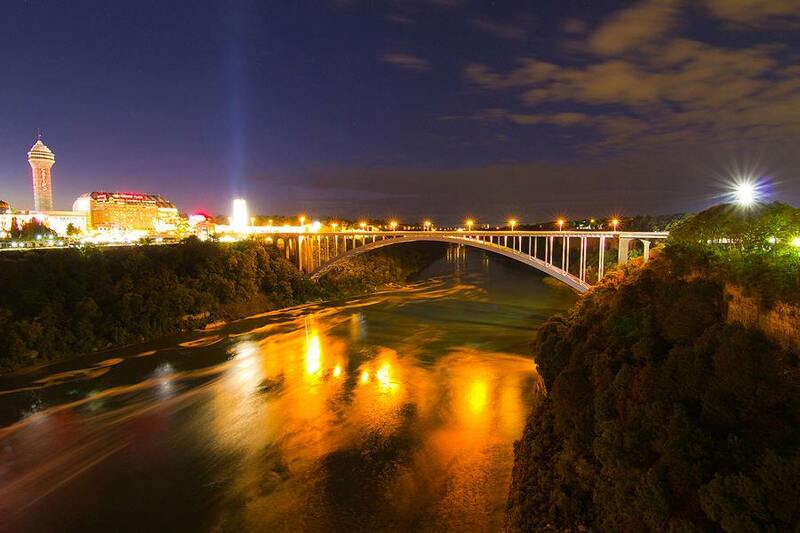 In Niagara Falls NY the Amtrak train station (825 Depot Ave W) is 1.6 mi/4.5 km from the Rainbow Bridge. Q: How far is the Bus terminal from the Falls. A: In Niagara Falls NY, the Trailways bus terminal (303 Rainbow Blvd. tel: 800-776-7548) is .6 miles/1 km from the Rainbow Bridge. In Niagara Falls Ontario the GoTransit terminal (4555 Erie St. tel: 905-357-2133) is 1.6 mi/2.5 km from the Rainbow bridge. Q: Where can I obtain driving directions and a map of Niagara Falls ? A: Visit our maps & info page. Q: Where can I park my car when visiting Niagara Falls ? A: If you are visiting just for the day there are overpriced municipally operated parking lots which charge a fee. In Niagara Falls New York you can park at the Niagara Reservation State Park near the Rainbow Bridge or on Goat Island. In Niagara Falls Canada there are parking lots near the “Table Rock House” adjacent to the Horseshoe Falls. When the lots fill up there is a shuttle service to satellite parking. If you are spending the night all hotels offer parking and there is almost always a fee. 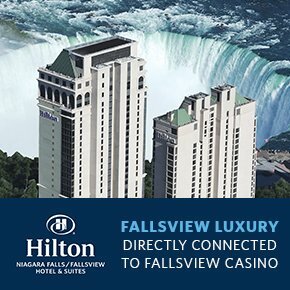 You can get discounted parking at the Fallsview Casino if you obtain a “frequent player card” which involves filling out a form to receive newsletters and other promotional information. Q: Is my US drivers license valid in Canada and vice versa? Q: Is my automobile insurance valid while in Canada? A: In most cases yes including car rentals. You may want to verify this with your insurance company. Q: Will my US cell phone work in Niagara Falls Canada and vice versa? A: Most major carriers (Verizon, AT&T, Rogers) service will work within about a mile of the international border. If you need to place your phone in roam mode additional charges are incurred. Usually $1.00 per minute. Many carriers now offer discount options and checking with your carrier before you arrive can save some headaches and money! Q: Do you arrange tours of the Falls? A: You can reserve a tour by checking our “tours” page. Q: Where can I exchange my currency ? A: There are quite a few currency exchange locations in the area and on both sides of the Rainbow Bridge. The best way to pay for your visit is to place everything on credit cards and typically you’ll get the best exchange rate from your bank. Q: I’ll be in New York City and would like to visit Niagara Falls. What are my options ? 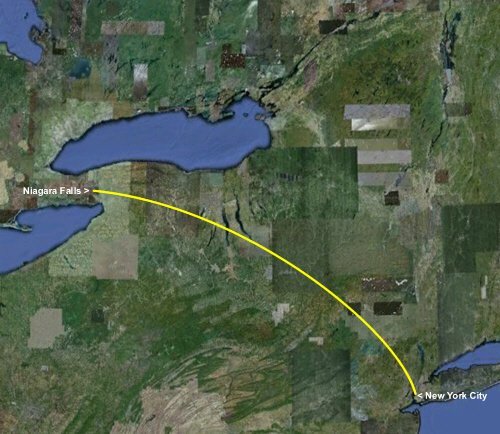 A: New York City is 406 mi/653 km from Niagara Falls. By car: It’s a 6.5 hour drive. The quickest route from NY City is to take interstate 80 west to 81 north to 90 west then 190 north to the Robert Moses Parkway. By plane: It is a 45 minute flight. From airport to airport it will usually take three to four hours including driving time to the falls. You can arrange for Buffalo Airport pickups and tours at niagaramajestic or taxi service through Buffalo Airport Taxi. It’s a 30 minute drive from the Buffalo airport to the Falls. By Train: The train ride is great, much of the route follows the New York State Barge Canal and Hudson River. The trip takes nine hours and costs $68.00 each way. Usually four departures daily starting at 7:00 A.M. until 4:00 P.M. Amtrak offers service from Penn Station in Manhattan. Visit Amtrak’s website for more details. Greyhound offers bus service to Niagara Falls. This route takes 9-11 hours and the fare is typically $55.00 one way or $105.00 round trip. Many departure times are available but the ride is exceptionally long.